A pair of sonnets for St. John the Baptist. Beacons and gateways for the child of light. In our poetic journey through the sacred seasons of the year we have come to midsummer! The traditional Church festival for this beautiful, long-lit solstice season is the Feast of St. John the Baptist, which falls on June 24th, which was midsummer day in the old Roman Calender. Luke tells us that John the Baptist was born about 6 months before Jesus, so this feast falls half way through the year, 6 months before Christmas! 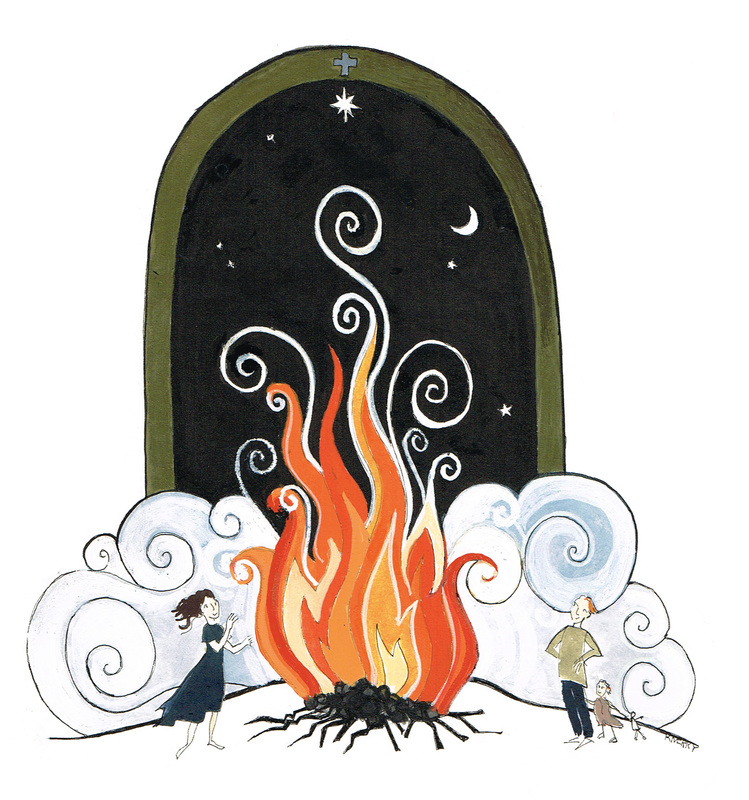 The tradition of keeping St. John’s Eve with the lighting of Bonfires and Beacons is very ancient, almost certainly pre-Christian, but in my view it is very fitting that it has become part of a Christian festivity. Christ keeps and fulfills all that was best in the old pagan forshadowings of his coming and this Midsummer festival of light is no exception. John was sent as a witness to the light that was coming into the world, and John wanted to point to that light, not stand in its way, hence his beautiful saying ‘He must increase and I must diminish’, a good watchword for all of those who are, as the prayer book calls us, the ‘ministers and stewards of his mysteries’. I have written two sonnets, one for St. John’s Eve reflecting on the lighting of the fires and another for St. John’s day in which , in honour of the Baptist, I reflect on the mystery and grace of baptism itself. I am very grateful to the artist Rebecca Merry for her beautiful interpretation of this feast and these poems. Both these sonnets were published in Sounding the Seasons, my cycle of seventy sonnets for the Church Year.The book is now back in stock on bothAmazon UK and USA It is now also out on Kindle. Please feel free to make use of this, and my other sonnets in church services and to copy and share them. If you can mention the book from which they are taken that would be great. As usual you can hear the poems by pressing the ‘play’ button if it appears, or else by clicking on the title. And makes one inner space an everywhere. Yearning to bring us to our birth again. For whom he bid the elements combine. Rejoice with those who roll the stone away. Both these sonnets were published in Sounding the Seasons, my cycle of seventy sonnets for the Church Year.The book is now back in stock on bothAmazon UK and USA and physical copies are available in Canada via Steve Bell. It is now also out on Kindle. Please feel free to make use of this, and my other sonnets in church services and to copy and share them. If you can mention the book from which they are taken that would be great. A pair of sonnets for St. John and St. John’s Eve.